There’s no in between with brussels sprouts – you either love ’em or hate ’em. I fall into the ‘love ’em’ category. This recipe, courtesy of Healthy Living Market, is fabulous. Apples, rosemary and the sweetness of the candied walnuts may even convert brussels sprout haters who may not like them because of their strong flavor. Before I get to the recipe, let me tell you about the market’s Learning Center. I’ve had the opportunity to take classes there in the past (we made empanadas). I knew that you could attend a class as an individual or even go with a group of friends. I hadn’t considered using the Learning Center for corporate events until the Web Instinct team planned an outing there. Prior to our class we all went apple picking. The market tailored our class to our specific request – apple recipes. We made Apple and Caramel Bread Pudding and Brussels Sprouts with Apples, Rosemary and Candied Walnuts and Pumpkin Ravioli with Brown Sage Butter. 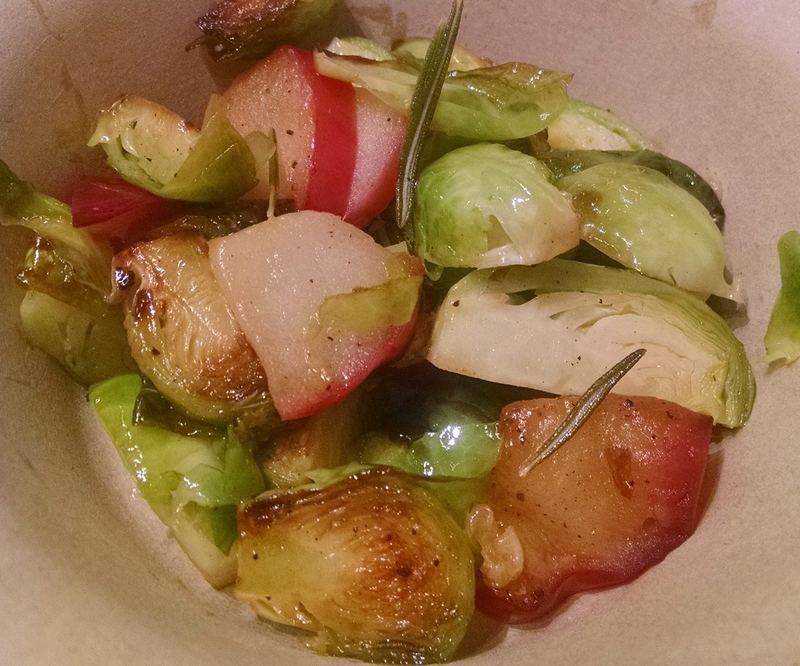 You’ll need butter, olive oil, brussels sprouts, an apple, salt, pepper and rosemary. You just have to cut the sprouts in half, after removing any discolored leaves or spots. You don’t even have to peel the apple. Just slice, making sure there are not pieces of core or seeds. Then heat up the butter and olive oil. Toss in the sprouts and apples. Add the rosemary and cook until tender. 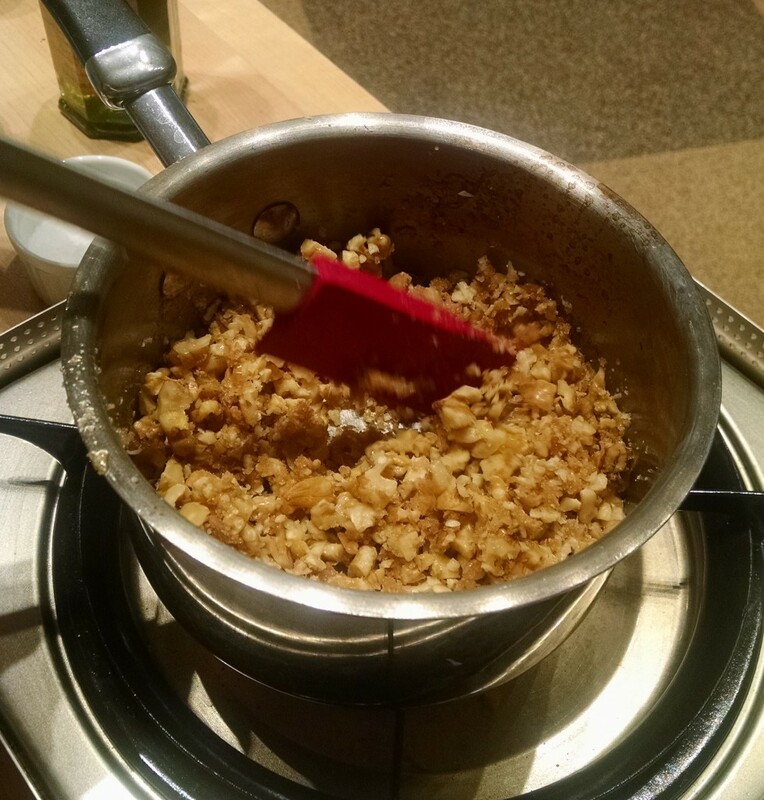 In a separate pan combine butter, sugar, brown sugar and walnuts. Stir for two minutes until caramelized. Set aside. You don’t need the nuts, but they do add a nice crunch to this dish. Here’s my dish of sprouts. Sans nuts. My teammate, Erin, added LOTS of nuts to hers. This dish can be served warm or at room temperature which makes it the perfect dinner party side dish. The complete recipe . . . hopefully you’ll give this a try. 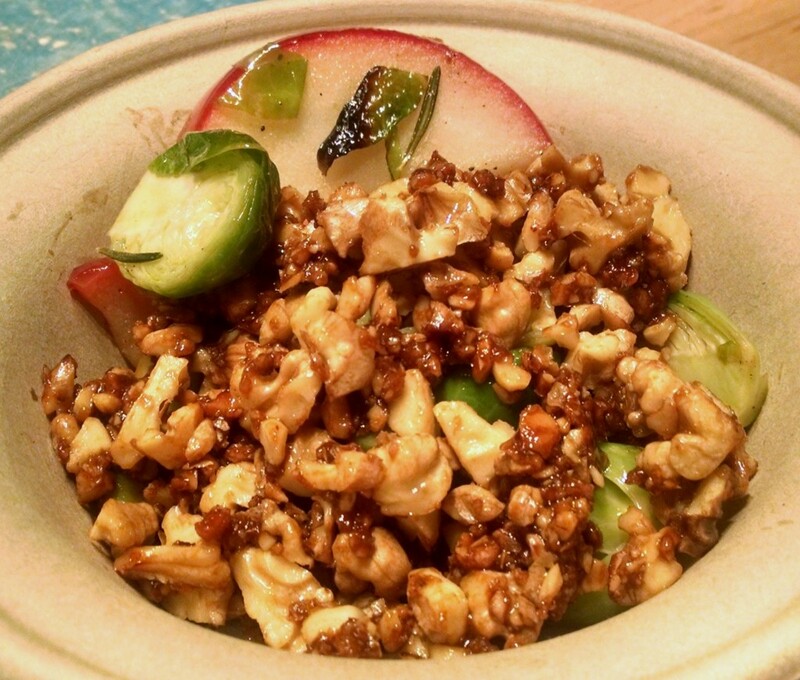 Brussels sprouts with apples, rosemary and candied walnuts - easy and delicious. 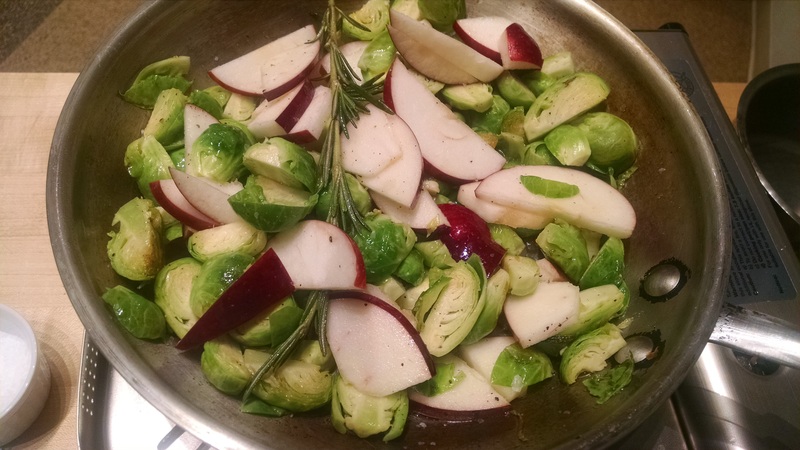 Add brussel sprouts and apples. Season with salt and pepper. Add the rosemary and cook over medium heat, STIRRING OCCASIONALLY (you want to get a good brown on your sprouts) for 8 minutes or until tender. Melt butter and sugars in a small saucepan. Add the nuts and stir for about 2 minutes.